The LightRig plugin places lights over the surface of any object. With LightRig you can set up complex lightning scenes in just a few minutes instead of hours. LightRig is capable of automatically reading the colors of the object in which the lights will be applied and set up these colors in the lights. This allows you to create rich-complex lit environments very fast and use the unparallel speed of Universe's Camera to fake HDRI type imagery in just a fraction of the time, or fake AreaLight type objects. 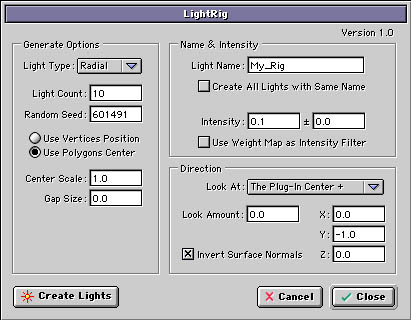 LightRig includes a variety of options to configure your light rigs, featuring the use of painted weight maps as intensity light-filter, use poly colors and/or textures (with alpha channel) to colorize your lights, intensity random controlled errors, random seeds, and "look At" light options with different options. Also, naming options are included so you can use your rigs with XPressionist™. LightRig is the ultimate time-saver plugin for your toolset.